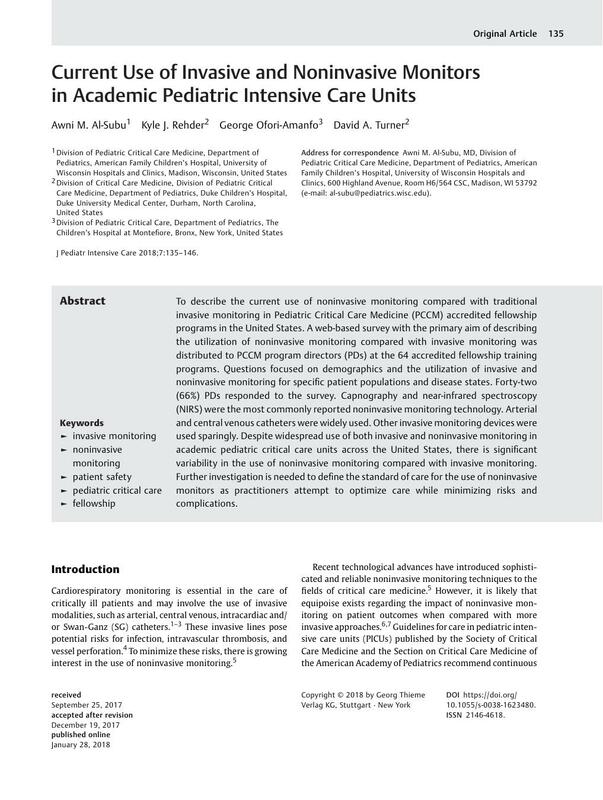 To describe the current use of noninvasive monitoring compared with traditional invasive monitoring in Pediatric Critical Care Medicine (PCCM) accredited fellowship programs in the United States. A web-based survey with the primary aim of describing the utilization of noninvasive monitoring compared with invasive monitoring was distributed to PCCM program directors (PDs) at the 64 accredited fellowship training programs. Questions focused on demographics and the utilization of invasive and noninvasive monitoring for specific patient populations and disease states. Forty-two (66%) PDs responded to the survey. Capnography and near-infrared spectroscopy (NIRS) were the most commonly reported noninvasive monitoring technology. Arterial and central venous catheters were widely used. Other invasive monitoring devices were used sparingly. Despite widespread use of both invasive and noninvasive monitoring in academic pediatric critical care units across the United States, there is significant variability in the use of noninvasive monitoring compared with invasive monitoring. Further investigation is needed to define the standard of care for the use of noninvasive monitors as practitioners attempt to optimize care while minimizing risks and complications. The study was conducted at the Duke University Medical Center.